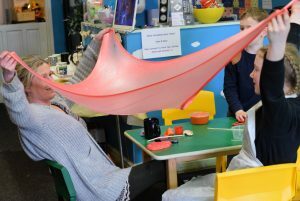 Slime making workshops are now available at Go Create! Join us for a fun-filled hour making your very own homemade slime. The price for this fun workshop is just £10. Spaces are strictly limited so book early to avoid disappointment. Please pay now using PayPal. We require the child’s name and age. Allergy advice is not required for this booking. Go Create! offers children from 0-12 years old the opportunity to get creative at our purpose built studio. from drawing, colouring and painting we have 66 brightly coloured drawers that children are free to use to create from their imagination or by copying many of our ideas. We have fairy houses and castles, superheros and dinosaurs. We have mermaids and princesses. Younger children can do gluing and sticking and painting. On weekends and during school holidays we often have workshops. This could include slime workshops, playdoh making workshops or craft workshops. Details will be posted on our Facebook page and can be booked on our website. We have tried hard to offer children an interesting inspired experience. We hope children take something away from their visit they can be truly proud of. I wanted to thank you for a brilliant party, everyone had a great time my little girl especially. The food was amazing, crafts excellent and the party games and disco really added to the whole day, you really made us feel all welcome so thank you once again. Had my daughter’s 2nd birthday party at Go Create today. We all had a fantastic time and it was such good value for money. The effort that the owners put in made the party so enjoyable, not just the messy play/creative set up but even down to the games, party dances and the lovely, thoughtful party bags. The food looked and tasted fab (and excellent quality – no processed rubbish in sight) all freshly made and good variety. Hope to be back for more sessions or parties in future! Just been with my 1 year old daughter for the first time. She loved it so much, we will definitely be going back! I took two seven year old girls to Go Create this afternoon. It has a lovely, friendly atmosphere and the girls were completely absorbed for well over two hours. There were lots of things to make and lots of ideas for them to follow. I sat and relaxed with a cup of tea!!!!! Just had my daughters 7th birthday party and we went for a science theme it was fantastic all who attended loved it! !well organised and lots of fun…I would highly recommend. Create it Merseyside Limited Registration number 09523469 T/A Go Create!